The term arthritis literally means inflammation of a joint, but is generally used to describe any condition in which there is damage to the cartilage. Damage of the cartilage in the shoulder joint causes shoulder arthritis. Inflammation is the body’s natural response to injury. The warning signs that inflammation presents are redness, swelling, heat and pain. Osteoarthritis causes joint pain and can limit a person’s normal range of motion (the ability to freely move and bend a joint). When severe, the shoulder joint may lose all movement, making a person disabled. Rheumatoid Arthritis: This is an auto-immune disease in which the body’s immune system (the body’s way of fighting infection) attacks healthy joints, tissues, and organs. Occurring most often in women of childbearing age (15-44), this disease inflames the lining (or synovium) of joints. It can cause pain, stiffness, swelling, and loss of function in joints. When severe, rheumatoid arthritis can deform, or change, a joint. Rheumatoid arthritis affects mostly joints of the hands and feet and tends to be symmetrical. This means the disease affects the same joints on both sides of the body (both the hands and both feet) at the same time and with the same symptoms. No other form of arthritis is symmetrical. About two to three times as many women as men have this disease. There are several forms of arthritis and the symptoms vary according to the form of arthritis. Each form affects the body differently. Arthritic symptoms generally include swelling and pain or tenderness in joints for more than two weeks, redness or heat in a joint, limitation of motion of joint and early morning stiffness. There is no cure for arthritis, so beware of ‘miracle cures’. Your doctor may prescribe anti-inflammatory medicine. They may recommend occupational therapy or physiotherapy, which includes exercises and heat treatment. In severe cases, surgery may be suggested. The type of surgery will depend on your age and severity of the disease. In the elderly with severe arthritis, joint replacement can give good results. 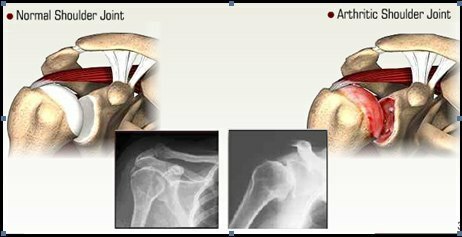 Common surgery for treatment of shoulder arthritis arthroplasty (replacement of the damaged joint) may be total shoulder arthroplasty or hemiarthroplasty.